Will Buttler continue batting in the same vein? The Kings XI Punjab (KXIP) will host the Rajasthan Royals (RR) in the match 32 of the ongoing Indian Premier League (IPL). This is the second time, the two teams are facing off this season and the previous fixture is still remembered for the infamous Mankading incident. Ravi Ashwin had dismissed the in-form Jos Buttler in an arguable way which is legal in the laws of cricket but it is deemed against the spirit of the game. 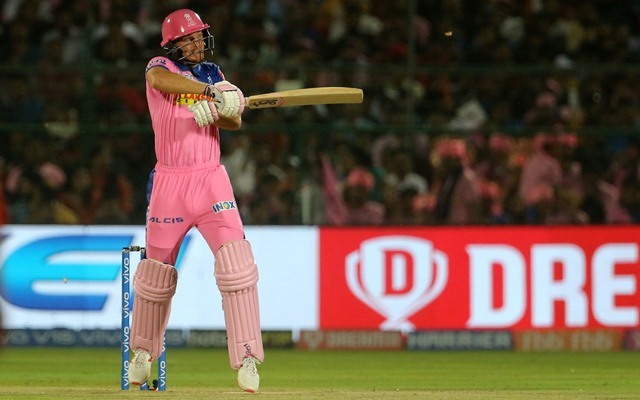 Buttler must be gunning to get going in this game and the fact that the Englishman is coming on the back of a match-winning knock against the Mumbai Indians (MI) makes him even more dangerous. This time he will be even more cautious in terms of leaving the crease early and the KXIP will have to way find a better way to get him out. The Royals are in a better frame of mind and they would love to continue the winning momentum. Jos Buttler loves batting against the KXIP bowlers. He has 312 runs to his name against them in just six outings at an impeccable average of 52 and a brilliant strike-rate of 156. Buttler has also smacked four half-centuries and the record seems to be only improving on Tuesday. Scores vs KXIP – 69, 82, 51, 77, 9, 24. Having said that, the England cricketer has played only once in Mohali and this should work in favour of the home team. In the only IPL knock in Mohali, Buttler had scored 24 runs off 13 deliveries way back in 2016. When it comes to recent form, Jos Buttler is the boss for the Royals. His fortunes have changed ever since he opened the innings last year and has continued in the same vein. He will hope to enjoy the game before leaving for home along with other England cricketers. Costs 10.5 credits in the batsmen category and is picked by 93% of teams. He is a good option to make the captain in the Fantasy teams.